An artist's illustration of the Tropical Rainfall Measuring Mission satellite in orbit around Earth. The satellite studied Earth's rainfall for 17 years and was retired in April 2015. It burned up in the atmosphere on on June 16. A dead NASA satellite plunged out of space today and burned up in the Earth's atmosphere over the South Indian Ocean, ending a nearly two-decade mission studying the planet's rainfall. 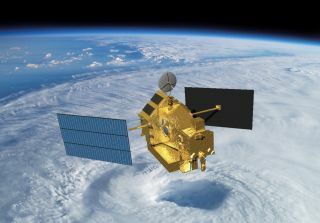 The Tropical Rainfall Measuring Mission satellite, or TRMM, fell from orbit at 2:54 a.m. EDT (0654 GMT) as it was streaking over the tropical region of the South Indian Ocean, NASA officials wrote in an update. The satellite, a joint mission by NASA and Japan's space agency, launched in 1997 to map Earth's rainfall for weather and climate scientists. "Any sightings of suspected TRMM debris should be reported to local authorities," NASA officials wrote in a statement. "The pieces of TRMM expected to survive re-entry are made of titanium and are not toxic. Debris could have sharp edges and should not be touched or handled, in the unlikely event someone were to find TRMM fragments." This U.S. Air Force map shows the path of the NASA-Japan Tropical Rainfall Measuring Mission satellite during its fall from space on June 16, 2015. The spacecraft ended a 17-year mission monitoring Earth's rainfall. NASA officials reported that the chances of debris from TRMM injuring a person were about 1 in 4,200, which the space agency called "a relatively low chance." The satellite was smaller than NASA's most recent spacecraft to fall out of space - the 6.5-ton Upper Atmosphere Research Satellite - which fell harmlessly back to Earth in September 2011. The TRMM satellite leaves behind a long legacy of science. "The value of the new type of precipitation data produced by TRMM is widely recognized by both the scientific community and the operational weather forecast community," NASA officials wrote. "TRMM data were used to improve weather models and hurricane track and intensity estimates around the world."